Looking for a bus driver appreciation printable? Choosing a gift for a bus driver is not an easy task, that’s for sure. I’m sure you, busy mama, are feeling just like me. The list of people that you need to buy Christmas gifts for seems to get longer each year. The mailman, your hairdresser, teachers, family and friends, neighbors, coworkers, your boss… The list could go on and on. And then you have Bus Driver Appreciation Day. Valentine’s Day. The last day of school. So, should you give your child’s bus driver a gift? Do you appreciate what that driver does everyday? Absolutely! Think about it. Bus drivers deal with erratic schedules, snowy roads and bad weather, bold students, and a strict time schedule (among other things that we are probably not even aware of). We all need to tell our kid’s bus driver thank you for driving my child safely. And unlike in your home or in the teacher’s classroom, that saintly bus driver has to deal with misbehaving students all while driving a 45 foot long bus. I get nervous driving in the snow with my OWN children in the back seat, I can’t imagine driving in bad weather with 90 kids that aren’t mine under my watch and care. But what gift can you give to this bus driver who keeps your child safe everyday? If you can’t possibly afford to buy one more person a gift, you don’t have to. 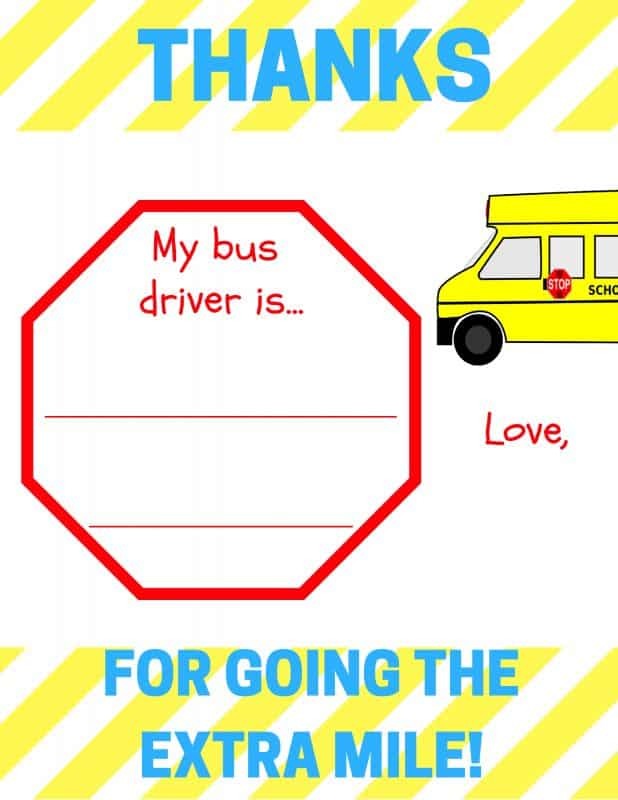 Enter this adorable bus driver appreciation printable. You can give this super cute school bus driver thank you card printable! I’m sure any bus driver in the universe would appreciate it because it’s a meaningful gift. And aren’t meaningful gifts the best ones? And don’t forget about the end of the school year. This printable would be perfect to say thanks on the last day of school. 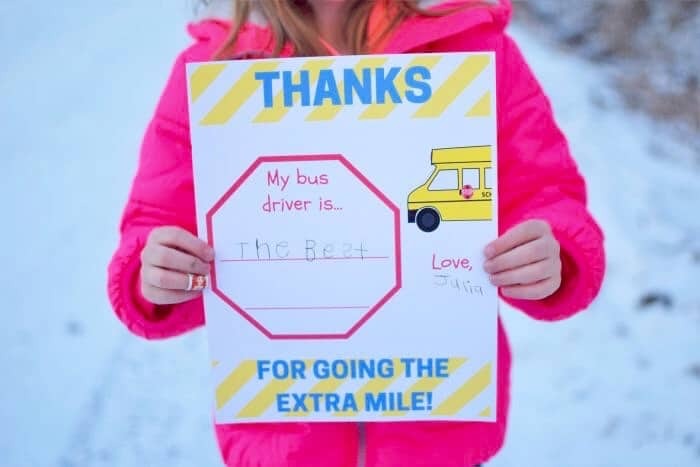 Ask your child to complete the sentence “My bus driver is” and have her sign it. A quick, free, awesome way to give a bus driver appreciation note. You can download your bus driver appreciation printable here. And don’t forget about your child’s teacher! Attach this printable teacher thank you note to any gift to make it even more special! Valentine Lunch Box Notes for Kids- Show Your Kids Some Lunch Box Love! Thanks so much! I hope you were able to use the free printable.